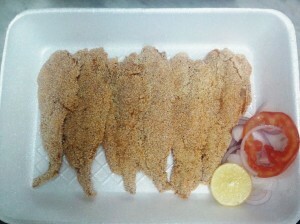 Bombay Duck in Mumbai– Bombay duck is one of the native fish of Mumbai waters, that we serve here at Gables in Colaba. The Fried bombil or Bombay duck preparation consists of dipping the soft fish in our spicy goan masala and then dabbing it in rava, before it touches the hot oil. The beautiful contrast in the crispy out layer and the inside soft white fish is what makes this dish so unique. Our Bombay Duck is locally sourced from the Colaba fish market. That is barely 200 metres away, so you get a steady flow of fresh fish. This ensures that the bombay duck is crispy from out and soft from inside.